Most of us spend hours of our day on digital devices such as computers, tablets and cell phones, causing headaches, eyestrain and dry irritated eyes. These symptoms are generally caused by our visual system being overworked and not blinking enough. When focusing on near objects emitting high energy blue light, our eye muscles are forced to work harder creating eye fatigue. This is compounded by the fact our eyes get dry and irritated when we do not blink enough. Because we are concentrating on near objects, we do not blink enough. This can lead to the glands in our eyelids (meibomian glands) to clog and stop secreting the lipids we need to maintain good tear filament. This is one of the causes of dry eye. The final cause of computer eye strain and headaches could be a binocular issue. This is when our eye muscles are unable to work together to allow proper focusing, especially when going from far to near. Symptoms can sometimes be relieved by introducing specialized prism in glasses and/or utilizing vision therapy to help train and strengthen your eye muscles. Some people experience severe headaches and strain that can be caused by the trigeminal nerve being stimulated by visual strain. We are now able to evaluate this with new instrumentation and help reduce symptoms with Neurolenses. North Country Eye Care in its effort to be one of the leading eyecare providers in the Northeast, will be the first practice in New England to offer this technology. 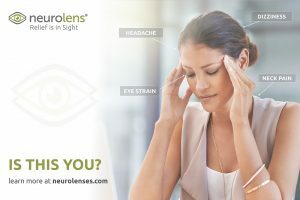 Please contact our office if you are interested in getting a screening for computer eye strain.